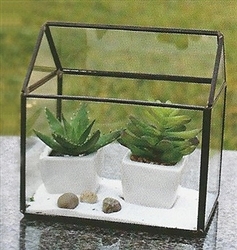 Glass A-frame terrarium. 6" tall, 6" long, 3.5" wide. These are nice quality, and look great! Black frame. Glass Bowl Vase, 3" x 8" Glass Rectangular Vase, 18" x 4" Glass Cylinder Vase, 6" x 4" Glass Cylinder Vase, 16" x 8"